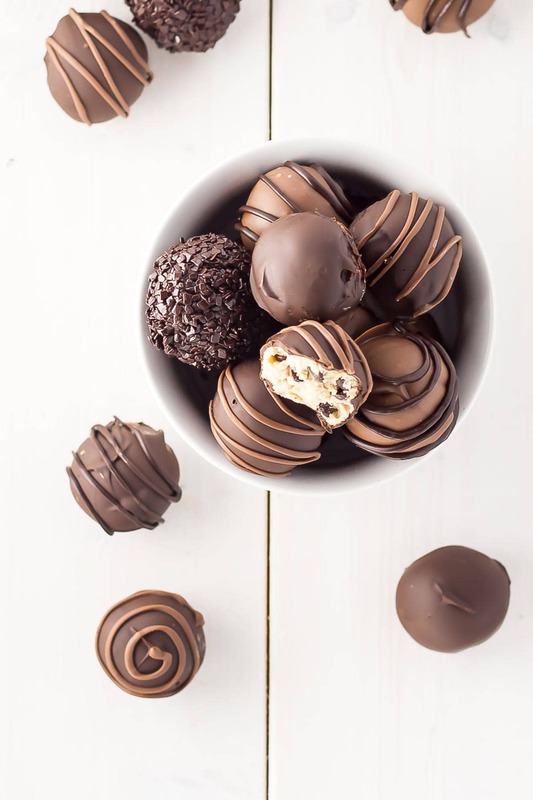 These egg-free edible Cookie Dough Truffles are the perfect bite-sized treat! I LOVE chocolate chip cookie dough. Specifically this chocolate chip cookie dough. It’s honestly the best thing ever. No shame that I eat it by the spoonful when I’m making those cookies. It’s almost better than the baked version. 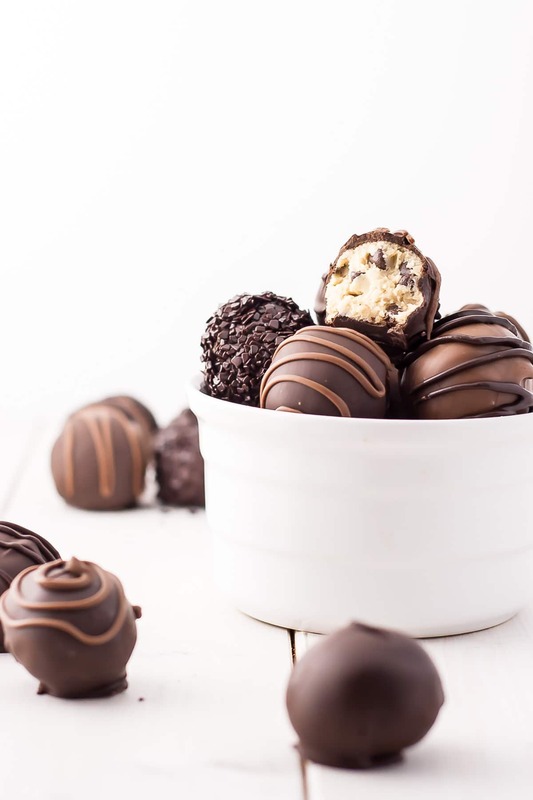 So, I adapted my favourite cookie dough recipe for these edible cookie dough truffles. This edible cookie dough is an eggless version that is totally safe to eat. But has anyone actually died of eating raw cookie dough? Like, was it 100% certain that was the cause?? I wanna know. ANYhow, many people understandably frown at the raw egg aspect, and eating raw eggs can be dangerous to some, so this version is completely egg-free. If you’re concerned about eating the raw flour too — you can bake the flour on a baking sheet at 350F for 5 minutes. This is said to kill off any lingering bacteria that may be present. 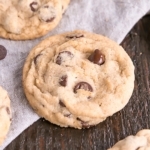 This edible cookie dough is super easy to make — any standard cookie recipe would do, really. Just scoop it into small balls, freeze, then dip into melted chocolate and you’re done. 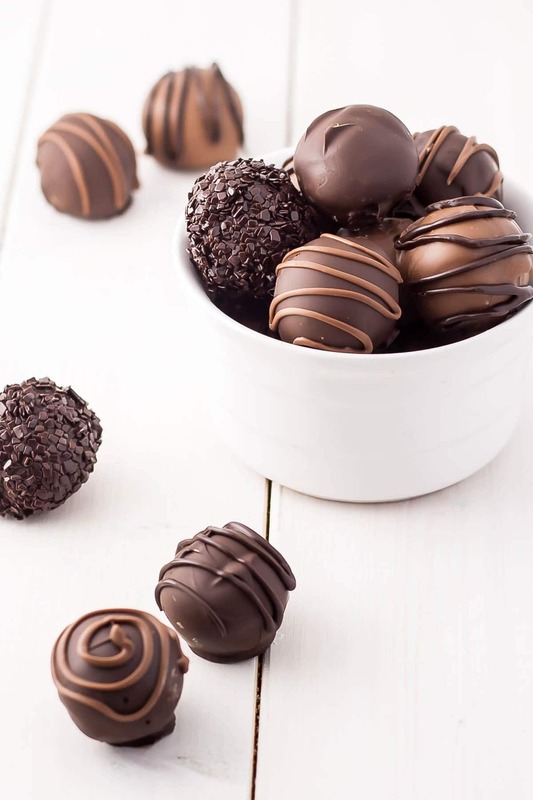 You have to do the chocolate dipping rather quickly since the cookie dough balls are frozen and the chocolate will start to harden right away. 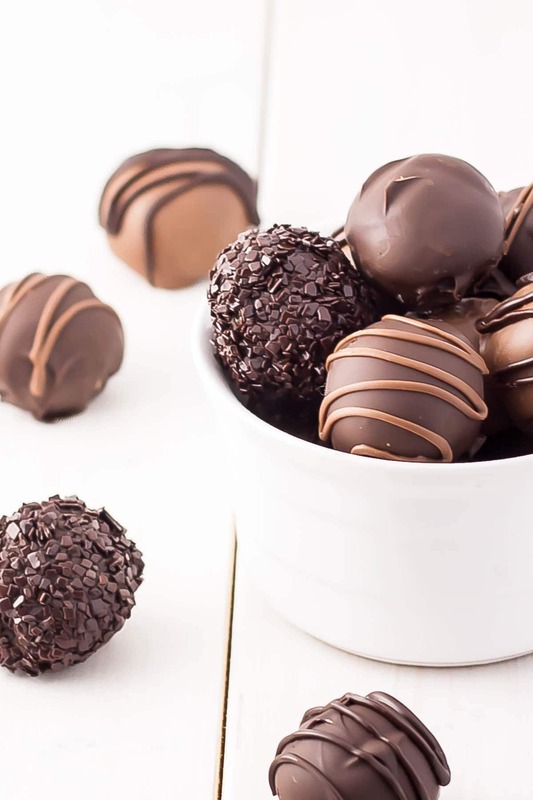 Basically, toss the cookie dough balls into a bowl of melted chocolate, one at a time, roll them around with a fork, scoop them out, and tap off the excess. I used both dark and milk chocolate for dipping and drizzle, as well as some chocolate flakes I picked up while I was looking for the dipping forks. I actually went to the store to buy a round cooling rack, which they didn’t have, and ended up buying all these other things that I “needed”. Those chocolate flakes though? Pretty happy with that purchase. These are just as delicious with no chocolate coating at all, so if you’re feeling lazy, you can totally skip that. These edible cookie dough truffles are a delicious (and safe) way to enjoy the very best guilty pleasure. 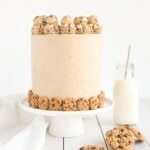 Cookie dough in a variety of flavours and textures which is sure to appeal to everyone! 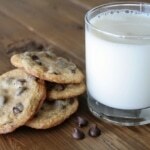 Looking for more Cookie Dough Recipes? These cookie dough truffles are egg-free and safe to eat. If you’re concerned about consuming raw flour you can bake the flour for 5mins at 350F before use. 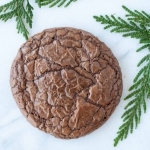 You can skip dipping them in chocolate if you’re just looking for an edible cookie dough recipe. I used a chocolate dipping fork to dip the chilled cookie dough balls into the chocolate. In a small bowl, whisk flour and salt, set aside. Reduce speed to low and slowly add in flour mixture. Mix until just incorporated. Slowly pour in milk. Increase speed to med-high and beat for 2-3 minutes. Stir in chocolate chips. Using a small cookie scoop (2 tsp), scoop cookie dough and roll into balls. Place on prepared baking sheet and freeze for 30mins. Place chopped chocolate into two separate microwave bowls. Microwave separately -- starting with 30 seconds, stir, then in 10 second intervals until chocolate is completely melted. Allow to cool slightly. Remove cookie dough balls from freezer and dip into melted chocolate using a fork or chocolate dipping tool. Place on parchment lined baking sheet and drizzle with additional chocolate if desired. Refrigerate for 15mins to set. Good recipe. The cookie dough tastes good but is very grainy. Add one more tbs. of milk and your good to go. Also it helps A TON if you freeze the cookie dough for an hour before rolling into balls and dipping it into the chocolate. It also makes less of a mess to clean up, but great recipe. Hi Ryan! So glad you liked it, thanks for the tips! Hi there! 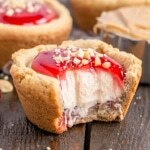 Came across this recipe a few weeks ago and I can’t wait to make them!! They’d be an awesome Christmas gift for teachers. Just a question, how long can we freeze them for? If I make them Monday, when is the latest I’d be able to give them? I like preparing early. They look delicious, thank you for the awesome recipe! Hi Li! You can freeze them for months, really, as long as they are in something airtight. If they are dipped in chocolate though, you might get some condensation on that, so I’d freeze them before dipping. They should keep about a week or so in the fridge though! These look amazing. 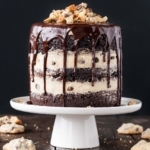 Can you share how to temper chocolate for these? Thanks. Hi Patty! I didn’t temper the chocolate — I just melted it. These look amazing and can not wait to try them. Question can I just use Peanut Butter in place of the butter to make them Peanut Butter Chocolate Chip? Hi Toni! That should work totally fine, but the pb could make them a bit softer if you swap it 1 for 1 with the butter. This might not be an issue since they are chilled anyhow, but if you wanted to play it safe you could start with replacing just half the butter with pb. Let me know how they turn out! Can these be left out/stored out of the fridge? And if so, for how long? I keep reading that they should be refrigerated but I wanted to make them for a candy jar for a party. Thanks! Hi Val! How long are you wanting to leave them out? I think they should be fine for a few hours. One thing to note is that since the chocolate isn’t tempered the might stick to each other if stacked in a candy jar. Hi I love these truffles they are so delicious! Can you do a cake batter version please? 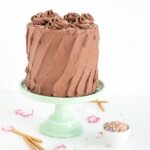 I love that I can convert your recipes to metric as I can’t find a cake batter truffle recipe in metric anywhere! Thank you for the deliciousness!! These look yummy! Do you think they’ll keep for a couple of days and can they be out of the fridge for a couple hours (while traveling) or will they begin to melt/loose their shape? Hi Jandra! They will totally keep and will be fine out of the fridge unless they’re somewhere hot! no se ponen al horno? tienen harina?? Hi Anneris! You do not bake these, and yes, they have flour. If you’re concerned, you can bake the flour alone at 350F for 5mins to kill any bacteria. Easy to make. I did, however, need to double the milk to get them to come together. Very tasty! Hi Teresa! So glad you liked them! Can these be kept in the freezer after coating in chocolate? Hi, I have one question, you use a flour which is not thermaly processed? Hi Kate! I have never had any issues with raw flour, but if you’d prefer, you can use an alternative. Hi Taleen! Yes, they will keep no problem! Just keep them in the fridge. After you melt the chocolate separately, did you combined the mild and dark chocolates? Hi Sherise! No, I dipped some in the milk and some in the dark. Okay, Okay…I’ve seen enough! I love your blog! You have a new food blogger friend in me! 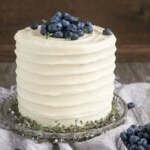 Another recipe pinned! These are the prettiest cookie dough bites I’ve ever seen! I wish I had a bowl to pop a few in my mouth right now! Thank you Amiee!! I *may* still have some in the freezer :D.
No problem at all :). Also, I can directly half the recipe and it will come out perfectly fine? And when it’s drying will the chocolate drop off? Yes, cutting the recipe in half would be perfectly fine! I’m not totally sure what you mean by drop off… You should tape off any excess chocolate after you’ve dipped them. The chocolate will stick to the cookie dough once it sets :). Hope that helps! Just so you know where you listed the ingredients, it says 1 cup four I think you meant flour. Great recipe though! Beautiful photos! Oh my sounds just like me, except hosting problems happened to me in December and yes I am on my third also, lets hope it’s three times lucky for both of us! 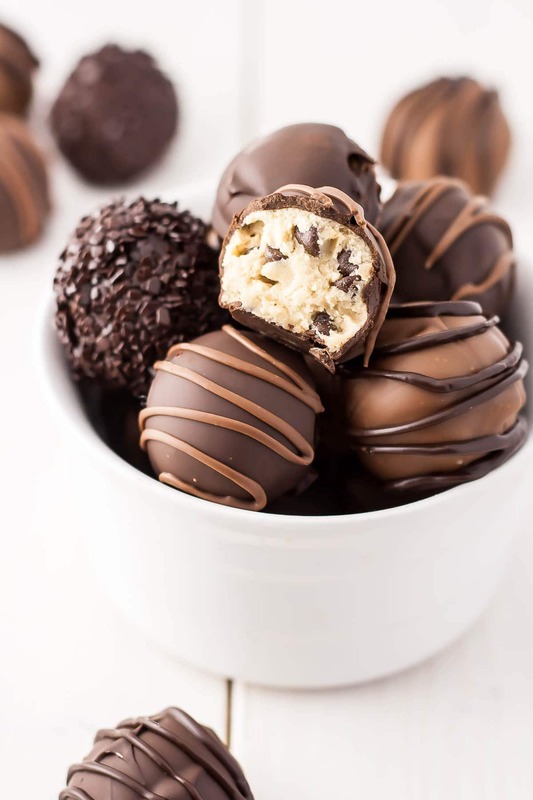 But I can say these amazing cookie dough truffles would be the perfect pick me up. They look delicious. Thanks June! They were actually quite fun to make :). 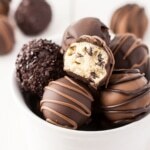 Your truffles look so delicious…and your photos are gorgeous too! I have never made truffles before, but I am going to try your recipe! I have always wanted to try making them! Thanks so much Michelle! They’re so easy to make. You will love them!